Now you can get your hands dirty because now there are Scooby-Doo Hot Dog Napkins. These Scooby-Doo paper napkins come in many sizes from cocktail style all the way to standard dinner size and you can pick between white or cream color. 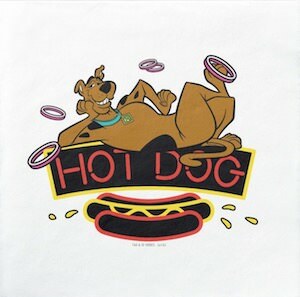 On these party napkins you can find Scooby-Doo just hanging around on a neon sign that says “Hot Dog” on it and shows a picture of a hot dog under it and besides all that there is some mustard and some onion rings to be found too. 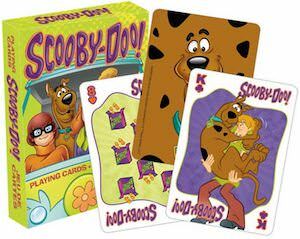 Now birthday parties, bbq parties, or maybe game night these Scooby-Doo napkins are just what you need. If you like a Scooby-Doo backpack then you are in luck because now there is the Scooby-Doo Mystery Machine backpack. 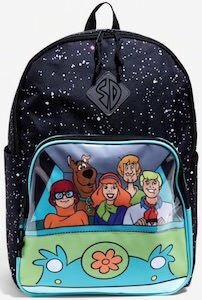 The backpack is black with stars on it and the Scooby-Doo logo and then there is a front pocket that looks like the front of the Mystery Machine with the gang inside it looking through the windshield. The Scooby-Doo backpack is 12 x 18 inches and even has a laptop sleeve inside it so that you can take your computer to school, work, or adventures. The Mystery Machine backpack has black adjustable straps to make it fit perfect on your body so come check it out. If you want a fun cap for summer then check out this Scooby-Doo cap. 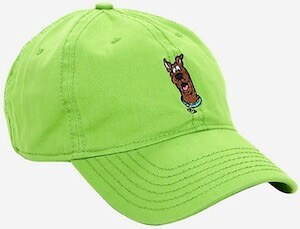 The cap is bright green in color and on the front it shows Scooby-Doo himself and on the back it has the Scooby-Doo logo just above where you can adjust the hat so that it will fit you perfectly. And if green is not your color then you can pick one up in navy blue too. This is not a cap made for small kids but teens and adults can both enjoy wearing this fun bright hat all summer long and by doing so people will know that you like the classic cartoon dog. Now you are set for a sunny day all thanks to Scooby-Doo and his hats. If your child needs a new bed and likes Scooby-Doo then you have to check out this Scooby-Doo bed. The bed is just perfect as it has the colors of The Mystery Machine and you can even find that van on the side and then on top of the headboard you find Scooby-Doo just lying down. The bed has a toy box and drawer build in and is made from MDF with a nontoxic finish. 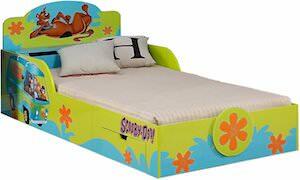 The Scooby-Doo bed is a wooden platform bed so a boxspring is not needed. Kids ages 3 – 12 can enjoy a good night sleep in this cute bed while dreaming about the adventures of Scooby-Doo. If you like Scooby-Doo and need a wallet then you just have to check out this bifold The Mystery Machine wallet. 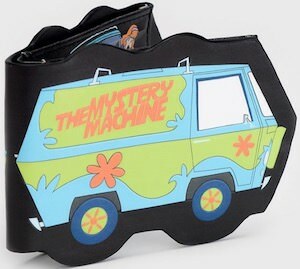 The wallet is shaped like the Mystery Machine and on the outside it shows the famous van from Scooby-Doo and on the inside you can see an image of the car from the front with all the character inside it. The Scooby-Doo wallet has a pocket for cash and slots for cards and one of the card slots has a window and inside it there you can put you ID so that you never have to take it out of your wallet again. 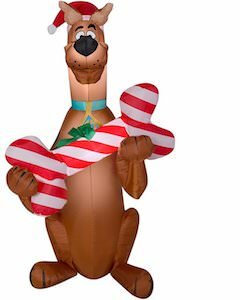 This holiday season you can have a Scooby-Doo Christmas inflatable so that people know you like dogs and Christmas. The outdoor inflatable is a 5 feet tall Scooby-Doo and Scooby is wearing a Santa hat and is holding a dog bone that is red and white just like a candy cane and it has a green bow on it. The Scooby-Doo outdoor inflatable is 5 feet tall and has LED lights build in so that you can see the Christmas Scooby-Doo at night too. And Scooby-Doo will automatically inflate when you plug him in so that he can stand tall in seconds and that means you can put him on a timer so he goes off at night. 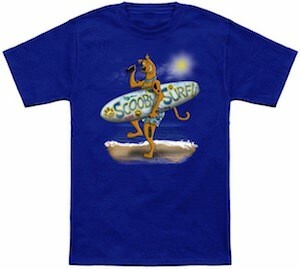 Scooby-Doo loves surfing and this t-shirt proves that. 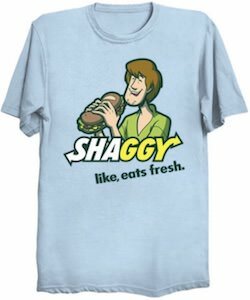 This Scooby-Doo t-shirt is available in many colors and sizes and is available in style for men, women, and kids so that the whole family can enjoy wearing one. On the t-shirt, you can see Scooby-Doo walking on the beach with hit surfboard under his arm and his sunglasses in his hand. He can’t be more ready to go in the ocean. A Scooby-Doo t-shirt like this is great for the true fans of this dog but even if you are not a fan it is just a great fun t-shirt to wear. 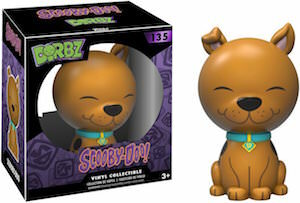 This Dorbz figurine of Scooby-Doo is number 135 in the series and looks adorable. The 3 inches tall vinyl figurine is great for your Scooby-Doo collection and even kids ages 3 and up can play with him. Scooby like all the Dorbz figures has a big round head which makes him look a bit different as the cartoon character but he still clearly is Scooby-Doo. Scooby-Doo is numbered 135 and comes in a cool see-through box that you could choose to keep him in if you want you figurine to stay in new state.